• Get ready for tons of racing action this Saturday, just over one week out from the start of WOODBINE’S 2009 season. SATURDAY MORNING is the DUBAI WORLD CUP CARD with 97 pre-entries for its blockbuster card. The big favourite for the DUBAI WORLD CUP (see pre-entries below) is DONN HANDICAP winner ALBERTUS MAXIMUS, seen galloping in Dubai yesterday morning. You can watch and wager on the DUBAI CARD through the Woodbine network beginning at 9:40 a.m. SATURDAY MORNING. Later in the day, a large Gulfstream Park card will include the FLORIDA DERBY. Kentucky Derby winner Lil E. Tee dies at age of 20. The following excerpt is from USA Today but referred to LIL E. TEE as a chestnut…that part has not been included (he was a bay). LEXINGTON, Ky. (AP) — Lil E. Tee, who upset heavily favored Arazi to win the 1992 Kentucky Derby, has died. He was 20. The horse was euthanized at Old Frankfort Stud on March 18. Farm owner Jim Plemmons said the horse fell ill last month following an operation to repair an obstructed bowel and struggled to recover. 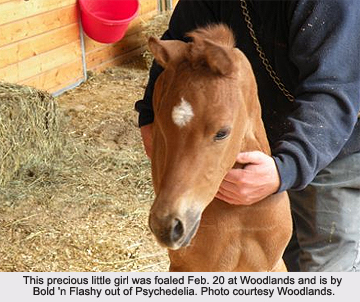 As a weanling, Lil E. Tee had nearly died but was saved by emergency stomach surgery. Considered to have little racing potential, he was sold for $2,000 as a yearling, and at age two his owner tried to sell him again but was rejected by an auction company who deemed the horse unsaleable. Lil E. Tee finally ended up in the hands of a Florida owner and was stabled at Calder Race Course in Miami, Florida where he showed some promise, winning a 7 furlong maiden race. 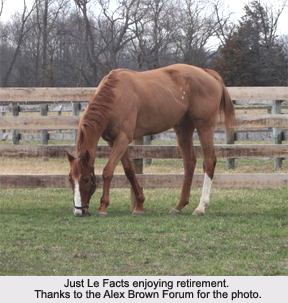 To all who have been following this tough little guy’s racing journey, thought you might like to know that Just Le Facts has been retired! His trainer recently sought out the Turning for Home program. Many of the folks involved with that program have been following Just Le Facts for a long, long time. One of them has adopted Just Le Facts – and Just Le Facts and his new owner couldn’t be happier! 9-year-old JUST LE FACTS, written about on this site many times, was 7th at Penn National last night in a $4,000 claimer. He won the Red Bank Handicap years ago and has earned over $259,000 from 48 races. TRIPPED UP: The quality of racing at Aqueduct during the winter isn’t the best but it may have hit a new low today. Entered in the fifth is Just Le Facts, a 9-year-old gelding who “broke down” at Philadelphia Park in his last start according to the comment issued in the Daily Racing Form on Jan. 19. In his previous start, Just Le Facts was eased at Aqueduct on Dec. 27. Since breaking down, the gelding allegedly worked twice, including a bullet workout on Feb.16 over the Belmont training track. Anyway, now we can celebrate JUST LE FACTS RETIREMENT FROM THE GAME. Good Luck JUSTIN! Betfair is the pioneer in the field of betting exchanges.